realcommercial.com.au is the market-leading commercial property site in Australia.1 The site provides comprehensive commercial property listings and information, allowing investors and business owners to search a wide variety of commercial properties available to lease or buy all over Australia. 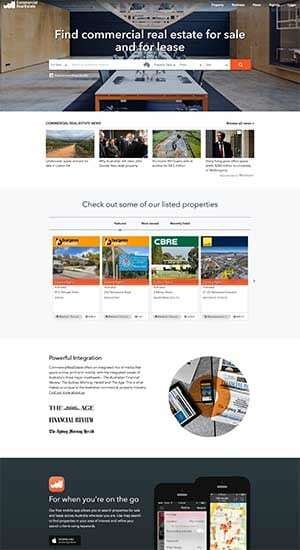 realcommercial.com.au and its residential property partner site realestate.com.au are owned and operated by REA Group (ASX: REA), a market-leading online advertising business specialising in real estate. The Group operates real estate websites in Australia and around the world. Established in 1998, commercialrealestate.com.au is a dedicated national business that operates as part of the Domain Group in Fairfax Media. commercialrealestate.com.au offers an integrated mix of media advertising solutions that spans online, print and mobile and is unique for the Australian commercial property industry. 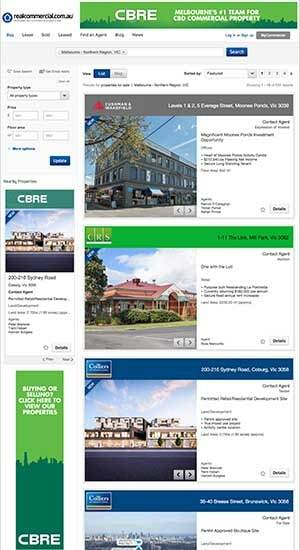 commercialrealestate.com.au’s multi-media platforms make it easy for property seekers to search and explore commercial property for sale and lease. And buyer’s can keep your eye on the market with property news, commentary and insightful content provided by highly experienced business and commercial real estate journalists. commercialrealestate.com.au enables users to quickly explore more than 50,000 listings including office, retail, industrial, warehouse, hotel and agricultural properties, as well as land. 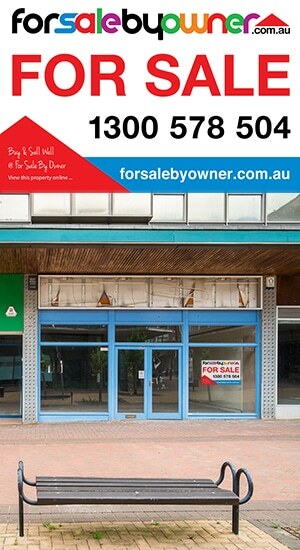 Over-and-above realcommercial.com.au and commercialrealestate.com.au (if selected), your property will be listed on forsalebyowner.com.au, as well as a variety of other portals. Some of the other portals to which we publish include juwai.com (Chinese Portal), propertyinvestor.com.au, and allhomes.com.au (optional – additional fee for certain postcodes in NSW & ACT). These additional portals are a great resource for both buyers and sellers. All accounts come with a professional ‘For Sale’ Board. Our boards are light but tough, weatherproof, and easy to install. A ‘For Sale’ board is an ever-present sales person for your property. By default, your board will come with our 1300 number on it. If you would prefer to have your own number listed, we can provide you a sticker with your phone number for $25, which you can then place over the existing 1300 number. Your ‘For Sale’ sign will generally be sent out as soon as you have confirmed your delivery address. In most cases your sign will arrive within a few days. Together with your board, we’ll also send you a welcome pack, including postcards which you can use to let others in your neighbourhood know that you are selling your house, as well as a notepad, buyer enquiry form, and large ‘Sold’ sticker. Create a great impression with our professional printable brochures. These high resolution brochures are print-ready and can be sent straight to a professional printer or can be printed from your home computer. They are great for giving out to people attending your home open, or for emailing to prospective buyers. We supply you with state-of-the-art brochure software which can be used to create your own brochure in minutes. Easily save and edit your brochures at any time. 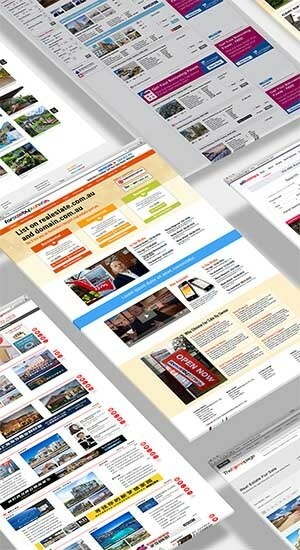 Our brochure creation tool uses Adobe® InDesign® CC Server software. This is exactly the same server software as used by many printing companies, and produces the highest possible quality print-ready documents. If you’d like to edit your listing, simply login any time and make any change you need to (edit the description price, photos etc.). Editing is fully automated and there is no charge for making changes to your listing. You do not need to wait for us to action edit requests; you are able to do this yourself at any time. We periodically run customer satisfaction surveys to assess how we are going and how we can improve our services. Along with our automatic enquiry handling system, our listing software is one of the main things past and current customers love about us. Real-time Enquiry Processing! We’ve invested considerable resources in making the enquiry process as fast and efficient as possible. There’s no need to wait for our staff to process incoming enquiries; our scripts automatically process all online enquiries. When a buyer makes an online enquiry on your property on sites like realestate.com.au, domain.com.au, homelsales.com.au etc. you’ll receive an automated SMS message. There’s no cost to you for this functionality. The minute that someone makes an online enquiry, you’ll receive their enquiry straight to your inbox, in real-time, and without intervention being necessary by us. The system is robust, automated and efficient. Our enquiry handling system is just another reason why we are industry leaders in the For Sale By Owner space. Selling your property yourself doesn’t mean you are alone. 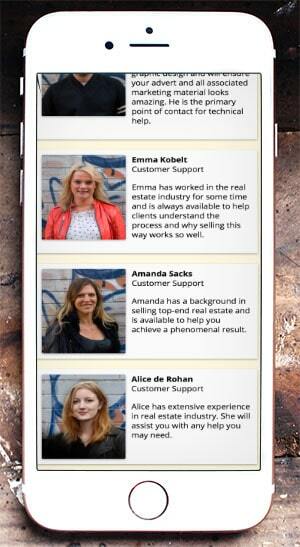 We have a team of people dedicated to making this process easy for you and more importantly, rewarding. We want you to do well and sell your property. We are available 24/7 to help with any questions you have. Simply contact us and ask. Like to get some feedback about the wording of your ad? Wondering whether you should specify $650,000 as the price, or quote a price range of $650,000 to $675,000? We can help with any and all questions. Simply give us a call or email us. We’re here to help you! The For Sale By Owner team includes current and past estate agents, IT Professionals, graphic designers, and marketing professionals. Whether you need help with something relating to the marketing of your property, or need technical help with anything, we’ve got right people to assist! As part of our commitment to provide excellent service, we offer extended support well outside office hours. For Sale By Owner does not use any external call-centres; when phoning, emailing or chatting online with us, you will always be dealing directly with an actual staff member. Currently, we’re available about 20 hours per day. We are easily contactable by phone, email and live chat, whichever method best suits your needs. Support includes not only technical issues you may need help with, but also any real estate advice you may need such as dealing with a specific offer, establishing and setting your price, conducting ‘Open for Inspections” etc. Click any row for full details. Both our packages are ‘Listed Until Sold’, with no monthly or ongoing fees payable. There are also no commissions payable once you’ve sold. Please use the address as it should appear on your invoice. This may or may not be the same as the property to be advertised. We'll send you an email with our bank details and reference number. After payment, you'll receive an automated email from us, and will be able to start listing your property straight away. 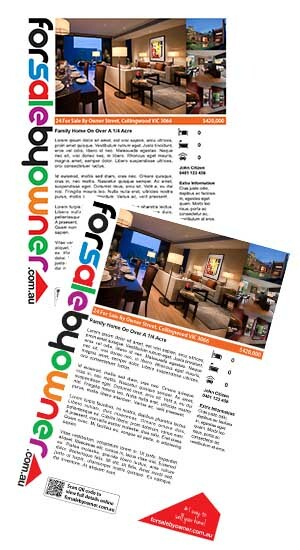 The www.forsalebyowner.com.au website (referred to in these Terms of Access as the “Website“) is owned and operated by Forsalebyowner.com.au Pty Ltd (“FSBO“). The material on the Website is copyright of FSBO and/or other copyright owners. The Listing fees advertised on the Website are charged once and include all administration charges in creating a property profile for you, including creating online advertising campaigns. All Charges are in Australian Dollars and are Inclusive of GST. Once a profile has been created our fee has been earned. We reserve the right to change the Terms of Access at any time by publishing the new terms on the Website. Your use of the Website constitutes your acceptance of those terms. Should you object to any of our terms of access, your sole option is to immediately cease using the Website. Information on the Website may not be regarded as a substitute for professional legal, financial or real estate advice and we recommend that as purchaser or vendor of real estate, that you should obtain professional advice prior to entering into any binding transaction. FSBO reserves all intellectual property rights, including, but not limited to, copyright in material and/or services provided by it. delays to, interruptions of or cessation of the services provided in the Website, or linked sites, whether caused through negligence of FSBO, its employees, agents or independent contractors, or through any other cause. For example, our arrangement with third party websites on which your property is advertised may change which may make it impossible or unviable for us to continue advertising your property on those websites in which case we reserve the right to discontinue such advertising and you agree that you may have no claim against us in this regard. FSBO may terminate access to the Website or any third party website at any time without giving any explanation or justification for the termination of access, and FSBO has no liability for any costs, losses or damages of any kind arising as a consequence of terminating access to the Website or any third party website. You will at all times indemnify and keep indemnified FSBO and its respective officers, employees and agents from and against any loss (including reasonable legal costs and expenses) or liability incurred by FSBO arising from any claim, demand, suit, action or proceeding by any person against FSBO where such loss or liability arose out of, in connection with or in respect of any breach of these Terms of Access by you; and publication of or distribution of information supplied by you. warrant that you have the right to grant the abovementioned licences; In this regard you will submit/upload a rates notice or copy of title and a photo ID identifying you as the owner of the property being advertised. If you are not the owner of that property you will need to explain to FSBO satisfaction your relationship to that property. unconditionally waive all moral rights (as defined by the Copyright Act 1968) which you may have in respect of the INFO. Understand that the content of the advert including all wording and photos is listed under the FSBO license and as such FSBO has the final say as to what content is displayed and how it will be displayed. We reserve the right to amend and change the advert without your approval or consent. monitor use of the Website, and store or disclose any information that we collect, including in order to investigate compliance with the Terms of Access or for the purposes of any police investigation or governmental request. Within 48 hours after the property has been sold or leased ( In this regard you agree to notify FSBO when the property is sold or leased). We don’t allow short-term (less than 3 months) “For Lease” adverts. If a tenant is found the advert must be removed. We reserve the right to remove any advert that suggests that the lease is a short-term lease. If any part of these Terms of Access is found to be void, unlawful, or unenforceable then that part will be severable from the balance of these Terms of Access and the severed part will not affect the validity and enforceability of any remaining provisions. These Terms of Access will be governed by and interpreted in accordance with the law of the State of Victoria, Australia, without giving effect to any principles of conflicts of laws. FSBO assists the you to conduct a private sale / private lease of your property by providing marketing services and does not act on behalf of the you in relation to the sale or lease transaction. 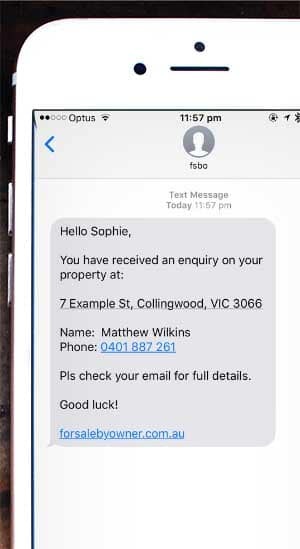 For the purpose of the Property Stock and Business Agents Act 2002 (NSW) and the Agents Act 2003 (ACT) and in all cases FSBO does not act on behalf of the seller in relation to a sale or lease and therefore will not conduct a preliminary physical inspection of the property. You are the owner of the property that you are using the services of FSBO to list or if you are not the owner, you have legal permission (to the satisfaction of FSBO) to list the property on behalf of the owner. You will be required to give a written and signed General Sale Authority to FSBO to market the property and understand that your property will not be listed until FSBO is satisfied as to your relationship to the property and your compliance of all these terms. For clarification we check that the registered owner is selling/leasing the property and has given FSBO the required authority to list the property. We Check the address of the property against the title and other on line mapping services and will only list a property with the address and suburb as displayed on theses documents. You may periodically need to confirm that your property is still available in order to keep your listing active. You agree to keep your contact details up-to-date so that we are able to contact you in this regard. Vendors in the state of NSW and ACT are required to be in possession of a valid ‘Contract of Sale” prior to commencing the advertising campaign. If the property in question is in either the NSW or ACT you agree that you will only publish the property when are in procession of theses documents. FSBO is not responsible for listings, information or any other listing data that may be published on other third-party websites (not included as a part of our service) such as onthehouse.com.au, oldlistings.com.au and alike. These websites are aggregator or historical data websites that scrape information from Real Estate portals such as realestate.com.au to provide their users with comparable sales data and other information. If you wish to have your property removed from these third-party websites, you must contact the website directly and ask them to have it removed. You agree to the jurisdiction of the courts of the State of Victoria, Australia, to determine any dispute arising out of your use of the Website and/or these Terms of Access.